If you’re anything like me, you’re working hard. You’re excited for what you’re creating and it shows - all of the photos saved on your phone, notes scribbled with new project ideas, drafts of blog posts and listing descriptions… it is a LOT. Eventually, it can become overwhelming and a just dissolve into a hot mess if you don’t figure out how to work smarter and not harder. Today is all about getting the most out of your efforts, and finally having time to move on to that next project you’ve been dreaming about (and rescheduling) the last 6 months. Below are 19 ways to make the most out of the content you’re already creating - those blog posts, product photos, and awesome Instagram captions can live a new life and give you a little extra oomph (or free time) and I promise it’s all without cheating. No one will notice or mind the content being re-worked a little - especially if they missed it the first time! BONUS: If you’re looking for a ton of content prompt ideas without having to rack your brain, I’m sharing a 90 days of awesome content prompts printable with you - so next time you’re sitting there with the laptop open and just feeling OVER IT you have a back-up plan. They are written specifically for artists and craftspeople. Just sign up at one of the links below! I’ve sectioned these out a bit by topic, but arranged them loosely from the easiest/most feasible right now to a few more long-term strategies. I also share 7 weekly content prompts on Instagram every Friday, so you can follow along with those too! #1: Have a great photo you’re excited to post to Instagram? Do a quick re-work of it for all the other platforms, too! You can make a quick template in Photoshop, Illustrator or whatever you’re most comfortable with and have it ready to go every time - it takes just seconds to pop a new photo into your templates, save it, and spread that image all over the inter-webs. 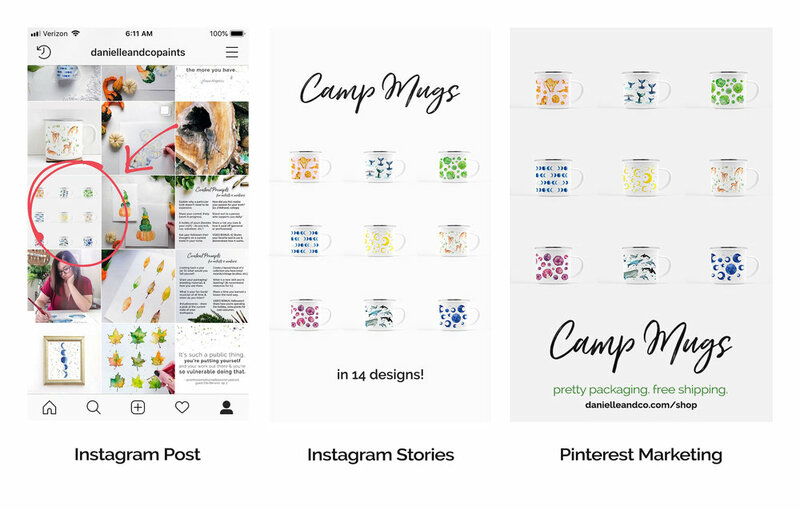 Below you can how I used the Layout app to create a grid of my new camp mug products. Then, I popped it into a template for Instagram Stories and shared it there. Then, I popped it into ANOTHER template for Pinterest, and shared it there. That’s 3 times the reach it would have gotten just as an Instagram post. Actually, I guess I just used it in this blog post too, sooo… 4 times. Would you be interested in some premade templates just for this? If so, comment on this post and let me know! It’s on my list of project ideas, if there is any interest. #2. While you’re taking those awesome photos of your new work, zoom in and snap a few close-ups or detail-shots too. Those little details and behind-the-scenes insights are often the things I most enjoy seeing, as a follower. It also creates a whole new set of images, making good use of your time. If you do a multi-image post on Instagram, the close-ups don’t have to show up on your grid permanently (if you don’t want them to), but they will still pop up on your follower’s feeds. Word of caution - be sure to know what your followers like and go with it! If you notice your close-ups are getting all of the love, share more of those - if they seem meh, dial it back. You can also step back and take a “behind the scenes” photo of your process for photographing your work, and share it on Instagram Stories - it feels very meta, but followers (especially other creative business people) love to see your methods and hard work in action. #3. Coming up with well-designed and attractive header images can be daunting. In the early days of your business, your aesthetic can evolve repeatedly making updates more frequent than you can keep up with. Why not take your best recent photos and create a collage or grid? Below is a Facebook header image I whipped up in a few minutes using my Instagram posts. Keep a template saved in Photoshop or another program, and you can update it as often as you need to for use on Etsy, Facebook, Spoonflower, and more. #4. If you create videos for social media or blog posts, you can upload those into a YouTube channel (or Instagram TV, now that it’s catching on!) and reach a whole new target audience. This is especially fun if you tend to feel bummed by how much video you have to cut (to keep it to 1 minute for Instagram); go ahead and ‘Gram the shortened version and let the full-length one live on YouTube in all of its glory! #5. If what you really need is a little extra cash, you can turn some of your photos into stock images. Sites such as Creative Market or Etsy make it easy to sell them to other creative entrepreneurs! Just make sure you’re really okay with them being used by others, and that they are general enough (they don’t show your specific art and sharing them won’t undermine your brand). For example: take a beautiful staged photo of your knitted hat with Christmas ornaments and knitting needles scattered artfully, and then remove the hat but leave the pretty set-up. It could be perfect for someone else looking for a general knitting + Christmas themed photo. Download your free 90 Days of Awesome Content checklist by subscribing below, and with 3 months worth of ideas to mix & match, you’ll never have what-to-post stress again. We won’t ever send you spam, and you can opt-out at any time. I can’t wait to get to know you better! You’ll receive an email soon confirming your subscription, and after that we’ll only send you good stuff - I promise. Our weekly newsletter includes a round-up of the newest blog posts, fresh content prompts to give you a boost, and cool stuff we’ve found on the internet. In the meantime, go ahead and download your free, printable 90 Days of Awesome Content Prompts checklist. #6. Make it a point once a season or so to go back and spruce up your old posts. Nothing makes a website look unprofessional faster than broken links and error messages! Once a blog post is linked somewhere like Pinterest, it can keep bringing in new traffic for years and that traffic is good traffic! Read through the post and add updates anywhere it would be helpful (such as if you recommended an app but since then found a better one), check links are working and swap out any images that are now totally off-brand for you. #7. The next time you dive into content planning, take a moment and check your analytics to see what’s been working for you. 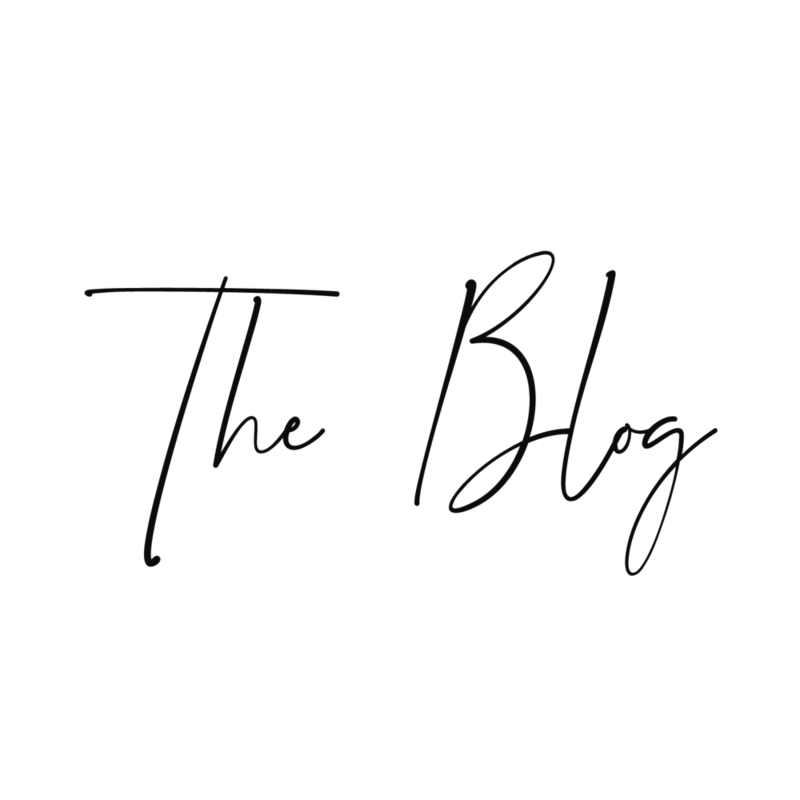 Review a popular blog post and see if there is a point buried in it you could expound on (to create a whole new blog post). When you’re generating ideas, blog posts can be planned out in series to get the most bang for your buck as you’re writing, and that could even go on to be a little e-book if you’re really looking to squeeze every drop of content-goodness out of it. #8. This is an easy one - refer to your older blog posts in your new ones! You’re likely already doing this, but try to make a point of taking one last look at your new post before you click publish and see if there aren’t opportunities to link to other content (not just old blog posts but also social media, affiliate product links, etc.). It not only will capitalize on past work you’ve done, it’ll be helpful for your readers too. #9. Make your blog archives more interesting! Most websites have an archive somewhere, linking back to past content - usually sorted by tag or date. Kick it up a notch by highlighting your past content in a unique way. For example, you could curate them onto a “Start Here” page, with your most helpful blog posts in the order you think would be most beneficial. 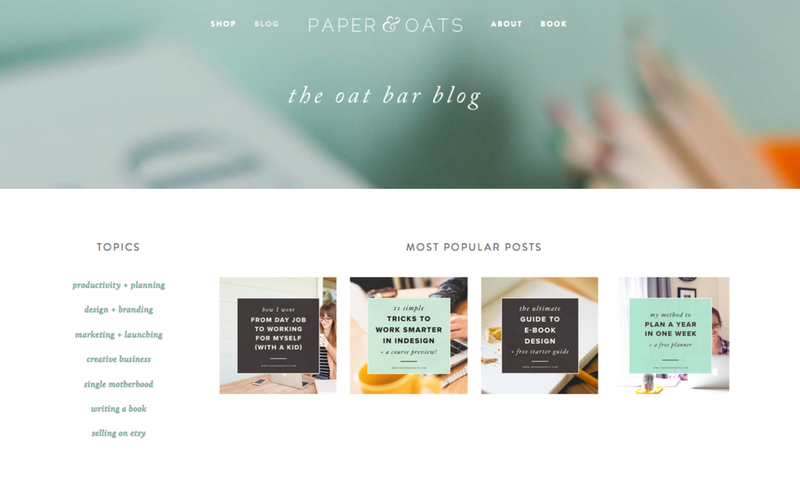 Or, you could have start things off with a list of your most popular posts (like Kelsey did from Paper & Oats, shown below). #10. If you’re looking to gain more experience and get your work in front of new audiences, there are many websites that accept articles (or even pay you a little bit for them!) so those old blog posts you have could be re-worked a bit and then submitted to your favorite online magazine or resource. Just make sure to follow the guidelines for the site you’re working with, which may require you to re-write it to a certain level of originality. Publishing your blog posts on Quora is an option too - check out this post on SmartBlogger, which gives you all the dets. #11. Create a newsletter welcome series, and start subscribers right off with your most useful evergreen blog posts. All of the major email newsletter hosts (Mailchimp, ConvertKit, and so on) offer a feature where you can schedule a series of blog posts to be sent when someone signs up. Having a little set of your best blog posts sent right to them is a great way to welcome new followers! Chances are if someone is just signing up, they haven’t read all of your older stuff so you can get them caught up quickly. #12. Turn those blog posts into something bigger. Make it a webinar, e-course, e-book, podcast… the list goes on! Brainstorm a list of topics you want to teach OR see if there is a theme you can pull from your blog posts. For instance, if you have 6 past blog posts all about selling at craft fairs you could gather those babies up and launch an “Ultimate Craft Fair Success Guide” e-course or booklet. Just be sure to add original content too, so your long-time followers still find it relevant. #13. Waste not, want not - if you have old paintings, printed photos or materials you’re ready to recycle, go ahead and turn them into cool and creative packaging. I’ve admired how Ingrid Sanchez of Creative Ingrid takes the beautiful watercolor-painted papers she is finished with and uses them for packaging (shown below, from her Instagram). I can only imagine how delighted her customers are to have this lovely little bonus arrive! #14. If you’re a photographer, painter or create any two-dimensional work, consider creating designs for products. It’s a way to open a whole new income possibility and reach audiences who might not be in the market for original artwork or prints. It can seem daunting (or even like cheating) to many artists, but I can say from personal experience I’ve really enjoyed the process. I love to watercolor paint, but giving them new life by creating a pattern or design is actually my favorite part. You don’t need to take on all of the work, either - there are plenty of professional print shops and print-on-demand companies that take part of the profit in return for most of the stress. As you can see, a little painting of a whale tail can become mugs, prints, scarves… and so much more. #15. Use product samples wisely. If you’re already selling products, you can take a sample of your work and then have it live on in so many helpful ways! If you’re using a print-on-demand company, you can often get discounts to order samples for yourself - if you hand-make your product, of course you already have some samples around. Say you have designed a mug - you can take one of your mugs and have a photo shoot to create listing images to sell it online. Then, snap some pretty pictures of it in action for social media. Keep it in good shape, and you could offer it as a giveaway prize to gain followers after that. #16. Round it all up in a newsletter with a little original content sprinkled in. It’s like a bonus for your followers, and ensures nobody is missing out on anything. 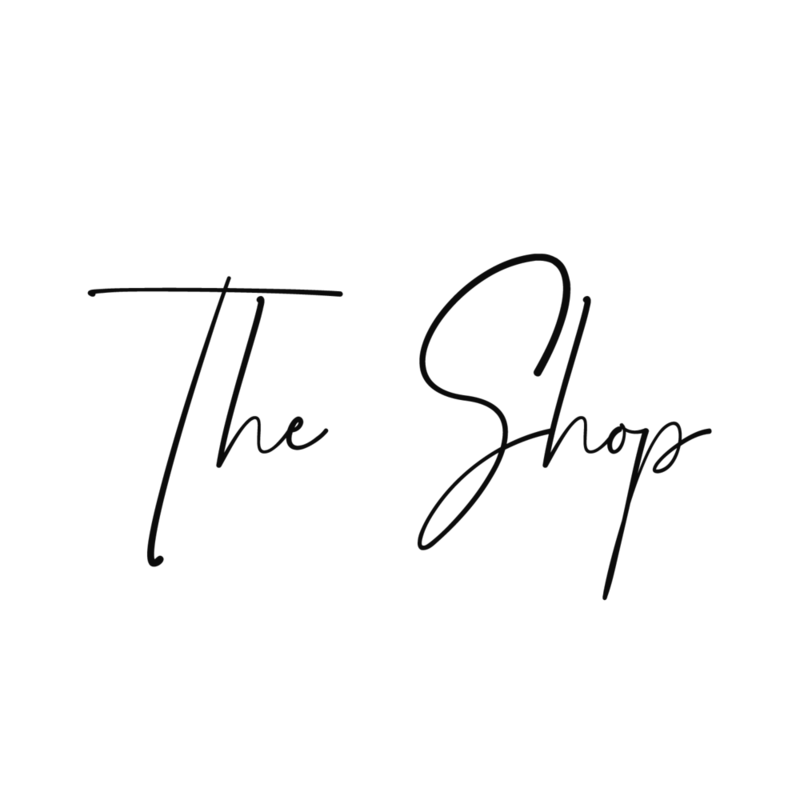 Whip up a little original content to start it off and then use it as an opportunity to highlight the best of your social media, link to new blog posts and new podcast episodes, and even offer special discounts or a first heads up on shop updates. This is a great way to encourage people to keep following you while making sure none of your content is lost and forgotten. #17. Plan your blog post or social media content strategically, with an end collection in mind. 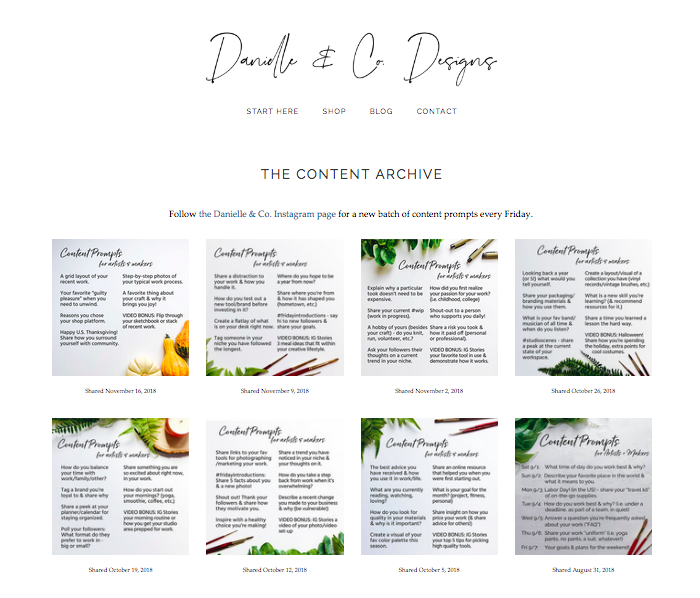 I know coming up with fresh ideas of what to post about can be hard for a lot of busy entrepreneurs, so I post a weekly set of content prompts every Friday on Instagram. While I tweak how they look depending on the week, I try to keep the format consistent so when they are compiled they make sense together. For anyone who needs more than a handful of ideas at a time, The Content Archive page (shown below) has it all in one place. This is a way to offer a service to others without having to generate any new content, and it takes me approximately 1.2 seconds to upload the new prompts every week. #18. Recycle content seasonally. For example, late November is a great time to begin linking to gift guide posts from previous years. Update any links for products no longer offered, but as long as you do your best to keep content evergreen, most things should carry over for awhile! #19. Share with your friends! I don’t recommend joining a fake Instagram pod thing, but I know I like to shout-out people who I authentically appreciate and they feel the same way. You could ask a close friend if you could swap products or services and share the results with each other’s followers, or write genuine testimonials you could each use on your websites. Often if you start appreciating and highlighting other artist’s work, you’ll see a return on your investment and you’ll feel good doing it. I hope these 19 ideas will help you get every single last drop of awesomeness out of your amazing content! The most important thing is to find what works for you. Reflect on what your community responds to and what you enjoy creating, and do more of it. What content is most successful for you? Comment below and share your tips with the rest of us! It may be small, but it is mighty. On Instagram, a hashtag can be a powerful thing. Hashtags are not only a way for a social media platform to sort posts into specific topics; it's a way for you to meet other people, discover new tools and resources, keep an eye on trends, get inspired, and more. Choosing your hashtags carefully is important. It affects who will see your own posts on Instagram, but also where you will end up networking in the wider Instagram community. For artists & makers, Instagram can be an especially creative & supportive space to share your work and see what others are doing as well. While I updated my own lists for this year, I thought I would share with you what I found! Below, I'm going to share just shy of 200 hashtags useful for painters & calligraphers specifically. First, though, let's talk about how to use their power for good, not evil. 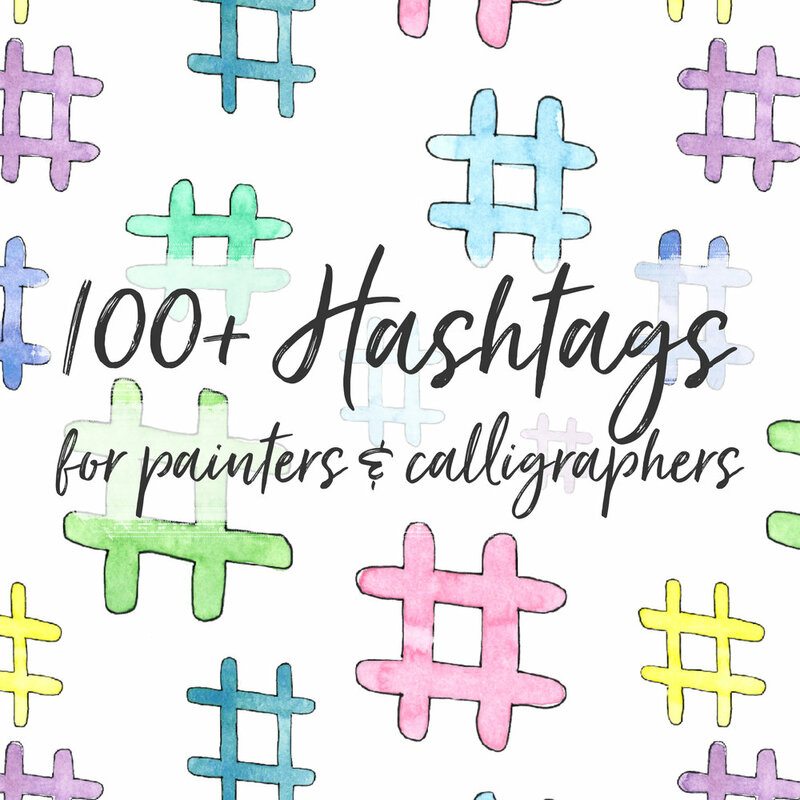 Brush up your hashtag lists with 100+ hashtags specific to painters & calligraphers. Don't use all the hashtags at once. Instagram limits you to 30 hashtags total (including both those in your post description and any comments you add), but they can also be pesky for your followers. It's no fun to have to scroll past a zillion hashtags, or have it right in your face. Be choosy of what you're tagging, and make them the most applicable and meaningful to your post. Balance the general with the specific. I've shared a lot of very general hashtags (like #art. You can't get more basic than that.) but you should combine these with some that are specific. For instance, if you're using a brush to create lettering with your watercolors you might want to use #brushlettering or if you're painting an scene of a street in New Orleans, adding #neworleans so that people specifically interested in those topics see your post. Keep them on your phone. Below is a screenshot of a Notes app page on my iPhone, where I keep some general watercolor hashtags saved. If you want to include the hashtags but don't want it to be part of the post that everyone sees as they scroll through their feed, you can use a method to add them in a comment. Some people prefer to use an app such as Notes to create 4 periods on different lines, with the hashtags below that. This way, the comment just shows "..." when people scroll past it, and no one sees the hashtags unless they click to view the comments. Tag businesses and products you support. If you use products by a specific company and they have a presence on Instagram, you can tag them in your posts. This not only helps your followers know what products you use and recommend and easily learn more about them, but if the business sees they may choose to showcase your work which can lead to more exposure. Some examples are Canson papers @cansonpaper, Kuretake Zig watercolors @kuretakezig_usa, Winsor and Newton paints @winsorandnewton, and Princeton brushes @princetonbrush. Join a challenge or embrace a weekly theme. There are so many challenges on Instagram for artists & designers! In a challenge, you might tag the leaders of it in your photos as you follow along that week, and may have specific topics and materials to use for certain time frames. For instance, if you are interested in calligraphy, @calligrabasics runs weekly challenges (right now it's "pencil week" so you can join in, get a push to be creative and network with other artists too. If you're finding yourself stumped for what to post about on given days, keep a list of weekly themes handy to reference. Some popular examples include #tbt, #throwbackthursday, and #followfriday. Keep in mind, if you pull this blog post up on your phone, you can go ahead and copy any of the hashtags below and paste them directly into your notes app to save for later! See my example, just below. If you're interested in more information on what apps I recommend, check out the 10 business & art apps on my phone right now and my 8 favorite photo and video editing apps. Well, that's a wrap! I hope these lists have been helpful, and I would love to keep the list growing! What hashtags do you use and recommend? Please share in the comments!